Hungary's Prime Minister Viktor Orban warned Europeans at a massive rally on Thursday that Europe is facing a migrant invasion and "those who don't block migration at their borders will be lost." Prime Minister Viktor Orban, speaking at a massive rally three weeks ahead of Hungary's parliamentary election, said Western Europe has surrendered with "its hands up" to a mass migration of people from Africa and the Middle East. "The situation is that those who don't block migration at their borders will be lost. They will be digested slowly but surely," said Orban, one of the nationalist politicians who has risen to power in Europe and been openly hostile to refugees and asylum-seekers. "The youth of Western Europe will still live to see when they become a minority in their own country and lose the only place in the world to call home," he added. ..."They want us to voluntarily give (our country) to others, to foreigners from other continents who don't speak our language, don't respect our culture, laws or lifestyle," Orban said. "They want to exchange ours for their own. There is no exaggeration in this." �Prime Minister Orb�n characterised the present ideological clash as one between ordinary people, patriots, and those who support nation-state democracy on the one hand, and cosmopolitan elitists on the other. �National and globalist forces have never squared up to each other so openly,� he said. �We, the millions with national feelings, are on one side; the elite �citizens of the world� are on the other side. �We who believe in nation-states, the defence of borders, the family and the value of work are on one side, and opposing us are those who want open society, a world without borders or nations, new forms of family, devalued work and cheap workers � all ruled over by an army of shadowy and unaccountable bureaucrats. 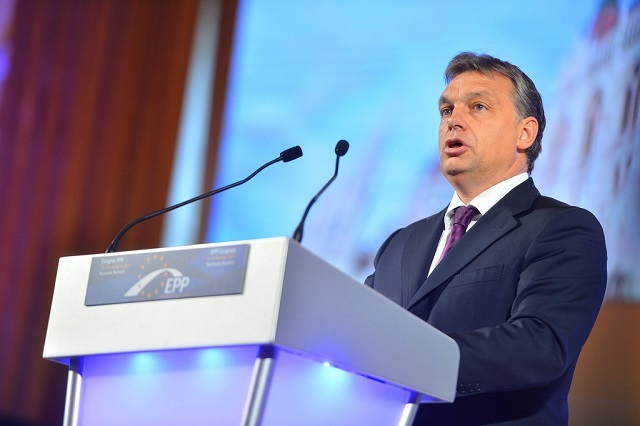 He declared that Fidesz would �fight for it to the end and never surrender�, but acknowledged the strength of the forces arrayed against it, which seek to �break Hungary, which stands in the path of immigrants; and settle thousands, then tens upon tens of thousands of immigrants in Hungary within a few years�. Finally, he warned that �Forces are appearing, the like of which the world has not seen for a long time. In Africa, there will be ten times as many young people as in Europe. �If Europe does nothing they will kick down the door on us. Brussels is not defending Europe and it is not halting immigration, but wants to support it and organise it. It wants to dilute the population of Europe and to replace it, to cast aside our culture, our way of life and everything which separates and distinguishes us Europeans from the other peoples of the world. See: With Open Gates: The forced collective suicide of European nations.